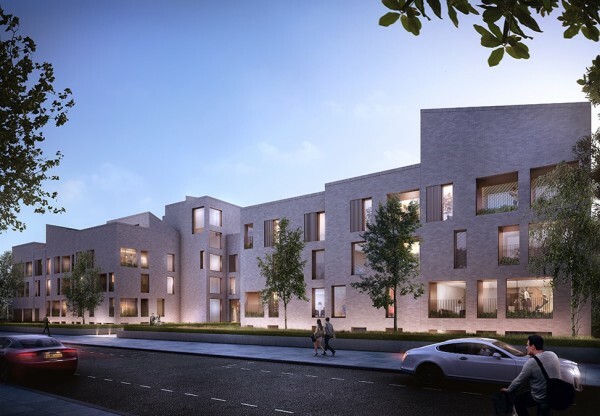 This series of new brick buildings will feature 74 high-quality residential units housed in a series of terraced villas together with a school for 100-150 pupils. The project has been conceived around a series of landscaped spaces that mediate between the scale of the buildings and their surrounding context. A pattern of flat, occupied rooftop terraces and pitched roofs further add to a rich and articulated massing that provides a variety of views from apartments while controlling and limiting overlooking. A communal entrance at the centre of the project offers a clear route through the scheme and links through the site to a rear courtyard with a colourful landscape providing a focus at the centre of the larger urban block in which the projects sits. The scheme utilises the sloping section of the site to prioritise pedestrian access, with all parking located below ground. Planning was granted in May 2016.